Highlands and Cashiers have seen great sales in real estate for 2017! In fact, it appears to be the strongest since the market fell off in 2006 & 2007. What many people don’t realize is that its lowest was 2012 (Case-Shiller Home Price Index). But before you get too excited, make sure you understand what this increase means. 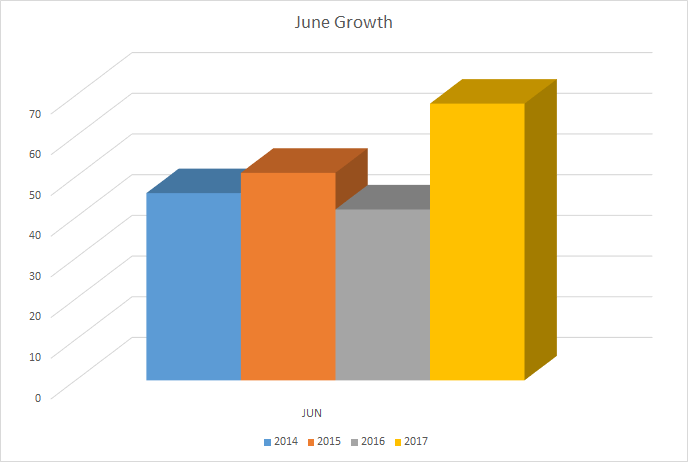 The real estate market for June 2017 has many positive signs. 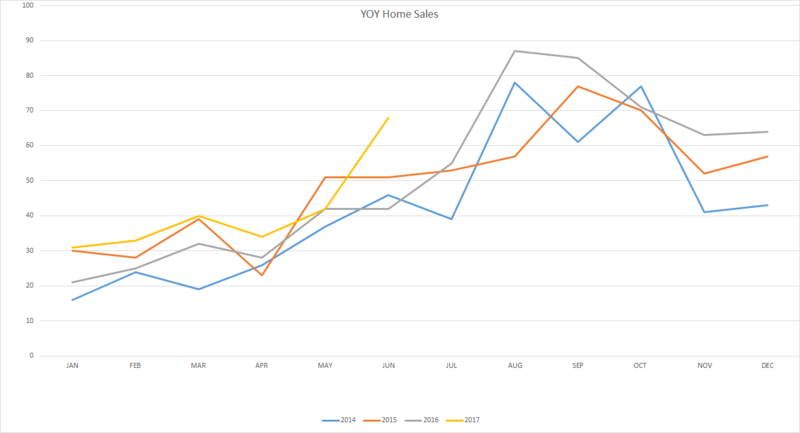 We see an overall increase in home sales compared to previous years. However, one needs to keep in mind that the market in the Highlands-Cashiers area is very seasonal. Still, the overall growth is a positive sign. One of the best indicators is not a month to month comparison, but Year Over Year data. This helps us to see longer trend effects. In the following chart, you can see where 2016 started of slow, then ended on a high. 2017 seems to be holding that high and looks to be the best year overall, if it stays on track. Total homes listed in Highlands/Cashiers MLS: 1253 – Although this is an increase, we sold a few more homes than we took on. This is a good thing in that it means overall inventory has been reduced. However, we still have a large inventory. Homes Sold This Month: 68 – This is a 61% increase from June 2016. Average Unit Sales per Month/1 Year Average: 54 – This is unchanged. What this shows is that although there were a significant number of homes sold in June, we are holding our yearly average. The increase for this 1 month is not significant enough to show any real change. YOY Inventory: 23 months – The overall picture is that inventory is still very high. Don’t plan on trying to increase the price on homes just yet. Average DOM: 293 – This is somewhat typical for this area. Average DOM (YOY): 425 – This has had some decrease. Still very high. Median Sales Price: $334,000 This is the middle of our market. This is back to last years numbers, after a few months slump into the $200,000 range. Average List/Sell Ratio: 93.18% – This is looking better. Still, it shows that Sellers have had to lower their prices to get their homes sold. It’s also an indicator that home list prices are considered by most to be too high. Synopsis: The real estate market sees hope. Still, one should not run ahead of the statistics. It may be best to have a wait and see attitude. If you’ve been on the market a while, you may want to ask your broker for a new CMA. Pricing is everything. Buyers determine what the market will do. We have to listen to them. Inventory: 6.5 years. There are simply too many homes and land available to justify development of land. Synopsis: It costs to develop land (water, excavating, etc). With such a large inventory, land will not bring great prices. The “land” market is just flooded. 10% of home sales ranged from $500,000 – $749,999. 16% of sales were above $1,000,000 (129% increase!). Selling Your Home? 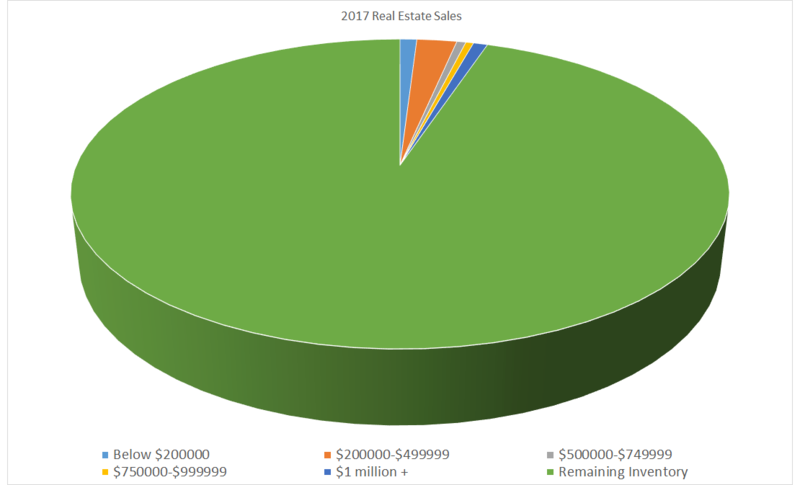 In a good real estate market, the “green” area (inventory) would only represent about 1/2 of the pie or less. This would show a strong market. In looking at data for Highlands, Cashiers, Sapphire and Glenville areas, we see a less than desirable market for Sellers, but a great opportunity for Buyers. However, the tides are changing. The economy is showing some strength and the latest from Housing Wire projects that new owners may be gaining equity in their home. BUYERS: With the latest trends in the housing market showing increase and the local real estate market showing the same, one may not want to delay too long in purchasing a home in Highlands, Cashiers and Glenville areas. As the market changes, so do Sellers attitudes on the value of their homes. We have some of the lowest prices now! SELLERS: Have your broker give you a new CMA if your home has been on the market a while. Find a broker that will show you all the facts to support their pricing. Make them explain to you why you should price that way. If your home has been on the market a while and you’ve had very few showings, ask them why. HINT: Overpriced homes do not have requests to be seen. The greatest centralization or cluster of homes that are selling are those near the town of Highlands and in Sapphire where there are amenities. Most buyers contemplate proximity to town, services and amenities as a major factor in the consideration in the purchase of a home. While some Sellers say, “I live here and I don’t think it’s too far out,” they fail to realize it doesn’t matter what any of us think. What matters is what the Buyer thinks. True, we may have purchased a property in a little more remote location, but look at the map. Where do the majority tend to buy? The further out your are, the more difficult to find a Buyer willing to live in such locations. Sellers sometimes say, “This is the right place for the right kind of Buyer.” That is true. However, when one makes a statement such as, “…the right kind of buyer,” they are indicating it’s not for everyone and thus limiting the market. In turn, a limited number of people will view such a property. How To Get Your Home Sold: The old adage in real estate is, “Location, location, location.” Although we may get tired of hearing that expression, it still holds true. Well, you can’t change your location so what’s left? Price. We simply can not compare the price of a home in the woods compared to one on the lake. We also can’t compare a home with a view that’s 20 minutes from town to a home with a view that’s 10 minutes from town. Don’t compare a home off a gravel road with one on paved streets. There’s simply too many variables. Listen to your Broker. Your Broker wants to sell your home. After all, they don’t get paid if it doesn’t sell. They’re also spending money out of their pocked for advertising, as well as time in marketing your home. If no one is looking at your home and your Broker has suggested you lower the price, then why wouldn’t you? Sentimental feelings, pride, etc. have no function nor value in the sale of your home. This is business and buyers treat it that way. Why shouldn’t you? Listings Needed: My last listing went under contract in 2 days. While the YOY average DOM is over 400, my listings average around 220. That means that my listings typically sell within 1 selling season. Also, while the local MLS List/Sell ratio hovers around 89-93%, my listings get 98.2% of list price. If you or someone you may know are serious about selling your home, please contact me right away (828) 506-0011. It takes time to determine your market value, take pictures and video and get marketing started. I will also give you a no-nonsense price to help you get your home sold. Share this post with your family and friends so they may get it to someone who would like to List/Sell their home. SOLAR ECLIPSE NOTICE: The path of totality is coming right through our office, beginning about 1:30pm. List your home or buy a home and get your glasses to come join us!